Its record-shattering 918 Spyder may have been the highlight but it was far from the only Porsche on display at this year’s Frankfurt Motor Show. Unveiled next to the mega plug-in hypercar was this – the freshly updated Panamera diesel which not only cops visual tweaks, but a more efficient, more powerful engine. Boasting a revised version of the Audi-sourced 3.0-litre V6 common rail diesel, the Panamera oiler now churns out 221kW/650Nm – up 37kW and 100Nm on the current model. A new crankshaft, pistons and water-cooled turbocharger provide the jump in grunt, with Porsche claiming a 0-100km/h time of six seconds (0.8sec quicker) and top speed 259km/h. As you’d expect economy is also improved, with Porsche citing an economy figure of 6.4L/100km. Further changes to the drivetrain include a tweaked eight-speed automatic gearbox and the addition of Porsche’s torque vectoring system as standard. Towing capacity is up too, with the four-dour Porsche capable of pulling 2600kg. 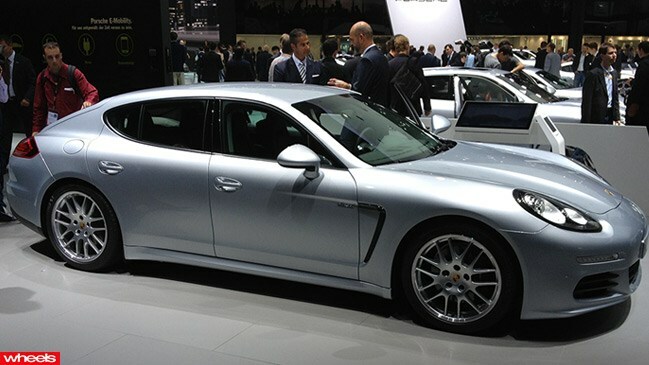 Expect to see the new Panamera diesel in Australia from March next year, priced at $204,600.